In the previous article (http://ponnadi.blogspot.in/2012/10/archavathara-anubhavam-introduction.html) we observed the parathvAdhi panchakam briefly and the general attachment of AzhwArs and AchAryas towards archAvathAra emperumAn. Before going into enjoy AzhwArs/AchAryas archAvathAra anubhavam, let us understand the various references for parathvAdhi panchakam by our AzhwArs/AchAryas and see why archAvathAram is glorified by them more than any other manifestations of emperumAn. parathvAdhi panchakam is explained in many places in sruthi. In katavalli and bruhadharanyaka upanishad, "Om pUrNam adha: pUrNam idham pUrNAth pUrNam udachyathE pUrNasya pUrNam AdhAya pUrNam EvA vasishyathE" is mentioned. This slOkam is often referred by our pUrvAchAryas. 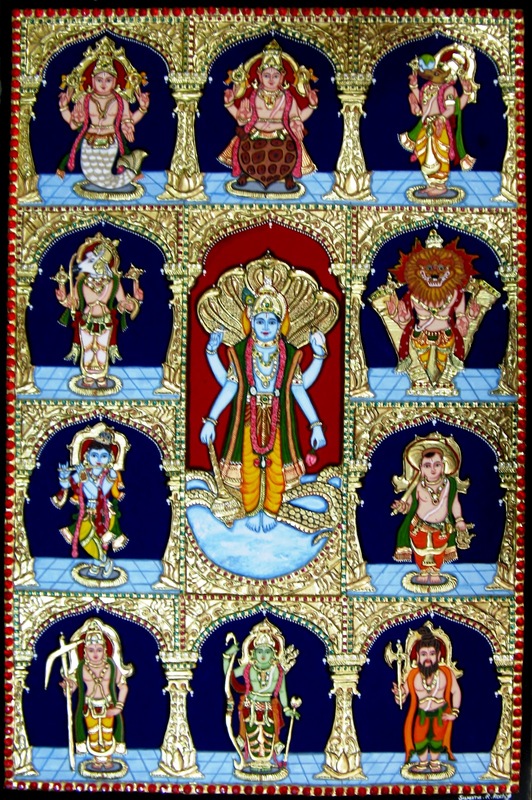 There are five pUrNam's in this slOkam and each are explained as one manisfestation of emperumAn. In the end it is said that "sarvam pUrNam sahOm" which indicates that emperumAn's qualities are fully manifested in archAvathAram. parathvAdhi panchakam is also explained in vishwaksEna samhithai by emperumAn himself and this is shown by mAmunigaL in his vyAkyAnam for thathva thryam sUthram 182.
vinNmIthiruppAy (விண்மீதிருப்பாய்) - paramapadha nAthan, one who is in sky - here sky means parama vyOmam which is paramapadham. malai mEl niRpAy (மலை மேல் நிற்பாய்) - thiruvEnkatamudaiyAn, one who is on the hills of thiruvEnkatam to give enjoyment for jIvAthmAs from nithya vibhUthi and leelA vibhUthi. kadal chErppAy (கடல் சேர்ப்பாய்) - kshIrAbdhi nAthan (anirudhan), one who is in kshIrAbdhi - usually vyUha mUrthy is related to kshIrAbdhi nAthan. He stays in kshIrAbdhi to solve the problems of brahmA, shiva, indhra, etc. manNmIthuzhalvAy (மண்மீதுழல்வாய்) - vibhavAvathArams like rAman, krishnan who toiled in the samsAram to do sAdhu parithrANam, dhushta nirasanam and dharma samsthApanam. ivaRRuL enGgum maRaiNthuRaivAy (இவற்றுள் எங்கும் மறைந்துறைவாய்) - as antharyAmi, one who lives within everything sentient and non-sentient. Also, in thiruviruththam pAsuram 55, AzhwAr identifies srivaishnavas as the ones who enjoy emperumAn through his different manifestations namely nIrppU (kshIrAbdhi nAthan), nilappU (archAvathAram) and maraththil oN pU (paramapadha nAthan). While only 3 types are discussed in this pAsuram, it is to be understood that parathvam includes antharyAmi and archAvathAram includes vibhavam. bhUthathAzhwAr discusses the five different manifestations of emperumAn in iraNdAm thiruvanthAdhi pAsuram 28.
pEyAzhwAr also discusses the five different places (and more) where emperumAn lives in mUnRAm thiruvanthAdhi pAsuram 32. ANdAL nAchiAr also enjoys the five different types of manifestations of emperumAn in the first 5 pAsurams of thiruppAvai. In the first pAsuram she says "nArAyaNanE namkkE parai tharuvAn" - nArAyaNa sabdham refers to ubhaya vibhUthi nAthan which shows his supremacy as seen in paramapadham. In the second pAsuram she says "pARkadaluL payya thuyinRa paraman" - vyUha mUrthy is often equated to kshIrAbdhi nAthan because he is staying in thiruppARkadal to help the dhEvathas and conduct the material world. In the third pAsuram she says "Ongi ulagaLantha uththaman" - here emperumAn's vAmana/thrivikrama avathAram are discussed. In the fourth pAsuram she says "Azhi mazhaik kaNNA" - here emperumAn's antharyAmithvam in parjanya dhEvathai is observed by ANdAL. 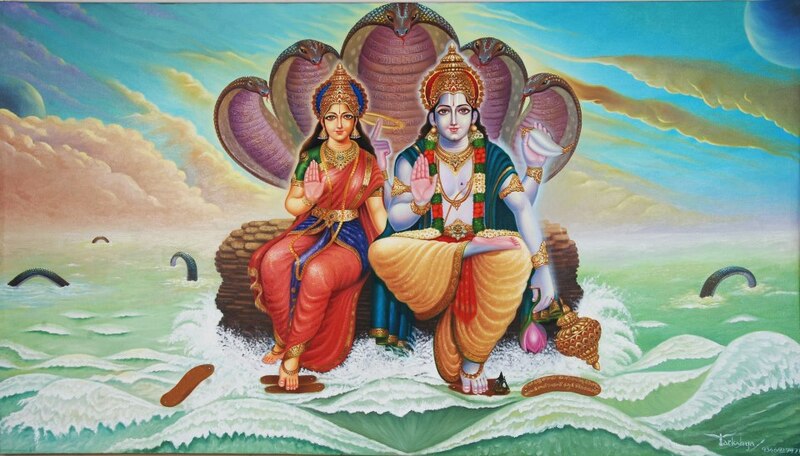 In the fifth pAsuram she says "vada mathurai maindhanai" - though emperumAn's avathAram in vibhavam is observed here, all vibhavams are worshipped through archAvathAram anyway and since there is specific mention of a dhivyadhEsam, it is said that ANdAL is enjoying his archAvathAram here. In the next pAsuram there is reference to "puLLaraiyan kOil" - puL means garudan, arayan means controllerr and kOil means temple - so this can also be seen as the temple of the controller of garudan (who is emperumAn). Our pUrvAchAryas have also discussed parathvAdhi panchakam in their various srisUkthis. thirukachi nambigaL in his dhEvarAja ashtakam (http://vedics.org/index.php?option=com_docman&amp;task=doc_download&amp;gid=37&amp;Itemid=215) identifies the 5 different manifestations in the first slOkam itself. praNathArthi hara - One who relieves the pains of his devotees. achyutha - na chyAvathi ithi achyutha - one who does not leave his dependants - he is always with everyone and everything in his antharyAmi form. I worship srIman nArAyaNan who is residing in paramapadham (also known as parama vyOmam) which is brighter than 1000s of suns glowing at the same time. emperumAn is full of all divine qualities like jnAnam, Anandham, etc. He is enjoying unlimited bliss with his dhivya mahishIs (sri bhU neeLa dhEvis) and is constantly served by the nithya sUris and mukthAthmAs. I worship kshIrAbdhi nAthan who represents the vyUha mUrthys who are situated in AmOdha, prammOdha and sammOdha sthambams. 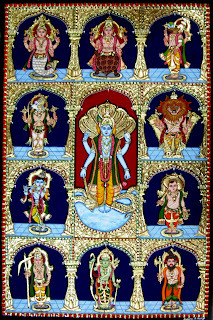 vyUha vAsudhEvan is complete in 6 qualities jnAnam (knowledge), balam (power), ishvaryam (wealth/ability to control), vIryam (force), shakthi (strength) and thEjas (beauty). Of these 6 qualities, 2 of them in sequence are seen predominantly in pradhyumnan, anirudhan and sankarshaNan respectively. 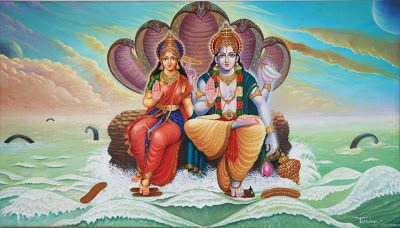 I worship vishNu who is situated in the hearts of yOgis in the size of their thumb (with a form) and who is situated with in the countless living entities and the countless universes as antharyAmi. I worship archAvathAra emperumAn who is situated in the 108 dhivya dhEsams, abhimAna sthalams, purANa kshEthrams, temples, mutts, thirumALigais, homes, etc., permanently to help his devotees. He accepts the forms that is pleasing to his devotees and he is completely putting himself under the control of his devotees in this archAvathAram. piLLai lOkAchAryar explains the parathvAdhi panchakam in thathva thrayam in a detailed manner. In his magnum opus srivachana bhUshaNam, he explains parathvAdhi panchakam in a few wonderful ways. Here, he gives excellent examples to explain the different types of manifestations and mAmunigaL's commentary explains the examples in a very nice way. In sUthram 39, he compares the different manifestations of emperumAn to different types of water and how helpful they are for a person who is thirsty. bhUgatha jalam - antharyAmi - Water underneath earth - this is invisible but is present everywhere. Still it is very difficult to reach since one has to break into the layers of earth to see it. The same way, antharyAmi emperumAn is present but can only be understood/seen by one who perfects ashtAnga yOgam. AvaraNa jalam - parathvam - Water outside the leelA vibhUthi - this is present but too far to reach out by anyone inside the leelA vibhUthi. The same way para vAsudhEvan is outside the reach of samsAris. pARkadal - vyUham - While kshIrAbdhi is inside the leelA vibhUthi unlike paramapadham, it is often only heard that it is present, but is very difficult to approach due to the distance factor. perukkARu - vibhavam - Water in a flooded river is present during specific seasons but it wont be there when we really need it later. The same way vibhavAvathArams happen in a specific time period and only who are present during that time period is fortunate to engage with them. athilE thEngina madukkaL - archAvathAram - but the flood water stays in small ponds which easily quench the thirst of a person who is in real need of water. The same way vibhavAvathAra emperumAns are represented by archAvathAra emperumAns in various dhivya dhEsams, kshEthrams, etc. These archAvathAram emperumAns are easily approachable by any one any time and is glorified as "pinnAnAr vanNangum chOthi" (பின்னானார் வணங்கும் சோதி) by thirumangai AzhwAr. They are there to be worshipped by people of all times (past, present and future). In the following sUthrams (449 and 450), the focus is to establish the supremacy of AchAryan over the parathvAdhi panchakam and how we should fully be focussed on serving our AchAryan who is even more easily accessible than the archAvathAram of emperumAn. The same example of "water for a thirsty person" is explained from a different aspect in sUthram 449.
jImUtha jalam - Water in cloud in the sky - its too high to reach out immediately. paramapadham is also in the spiritual sky and is difficult to reach out immediately. sAgara saleelam - water in ocean - its salty so not readily usable. vyUham (kshIrAbdhi) is only readily reachable by dhEvas. sarith saleelam - river water - its only useful for people who lived during the floods. vibhavam is accessible only for people who lived during those times. In sUthram 450, the purposes/activities of emperumAn in his different forms are explained. 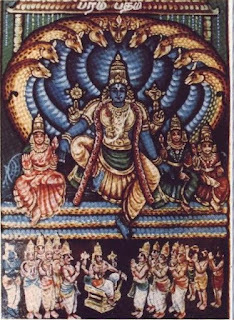 pAttu kEtkum idam (பாட்டுக் கேட்கும் இடம்) - paramapadham - Where emperumAn blissfully listens to sAma gAnam of nithya sUris and mukthAthmAs. kUppIdu kEtkum idam (கூப்பீடு கேட்கும் இடம்) - kshIrAbdhi - Where emperumAn listens to the complaints/miseries of brahmAdhi dhEvas. guthiththa idam (குதித்த இடம்) - vibhavam - Where emperumAn jumps into samsAram to do sAdhu parithrANam, dhushta nirasanam and dharma samsthApanam. vaLaiththa idam (வளைத்த இடம்) - archAvathAram - Where emperumAn takes a place in every village, town, city, etc., to attract people towards him. This is also explained as antharyAmi. Uttum idam (ஊட்டும் இடம்) - antharyAmi - Where he stays within everyone's hearts and feeds them with good thoughts and opportunities. azhagiya maNavALa perumAL nAyanAr explains parathvAdhi panchakam in his magnum opus AchArya hrudhayam chUrNikai 137. Let us see his anubhavam where he compares emperumAn to be a king and the five different activities of the king. pagalOlakkam irunthu (பகலோலக்கம் இருந்து) - paramapadham - usually kings have their general assembly during bright day light - here emperumAn is having a big assembly in paramapadham where it is always bright. kaRuppuduththu chOdhiththu (கறுப்புடுத்துச் சோதித்து) - antharyami - He hides himself to check the proper functioning of his citizens - here emperumAn hides himself and stays with in the heart of every one. kAriyam maNthiriththu (காரியம் மந்திரித்து) - vyUham - the king discusses with his ministers, etc to rectify the issues - here emperumAn as kshIrAbdhi nathan discusses with brahmA, shiva, indhran, etc in kshIrAdhi. 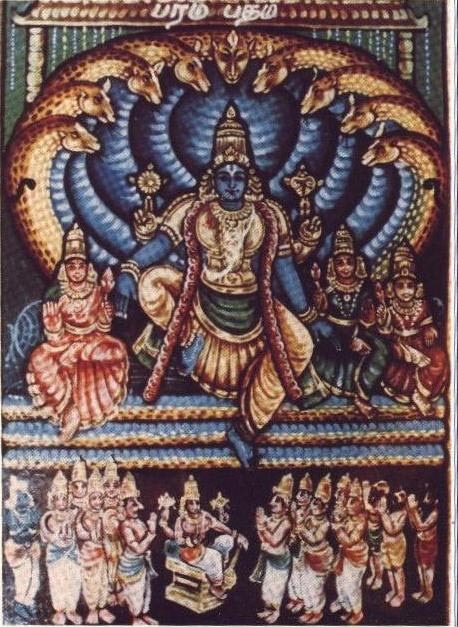 vEttaiyAdi (வேட்டையாடி) - vibhavam - the king goes to the forests to hunt for the evil beasts and animals - here emperumAn takes various vibhavam forms and hunts for evil asuras and rAkshasas. ArAmanGgaLil viLaiyAdum (ஆராமங்களில் விளையாடும்) - archAvathAram - the king goes to a garden and relaxes there peacefully - here emperumAn comes to the dhivyadhEsams like srirangam which are explained as vaNdinam uralum chOlai (வண்டினம் உரலும் சோலை) where he enjoys many uthsavams like nithya (daily) uthsavam, paksha (bi-weekly) uthsavam, mAsa (monthly) uthsavam, varusha (annual) uthsavam, etc. Now, that we have seen the parathvAdhi panchakam in sufficient detail, we will understand the greatness of archAvathAram through the simple but a powerful srIsUkthi of mAmunigaL. In thiruvAimozhi nURRanthAdhi pAsuram 26, he summarizes all the different types of manifestations of emperumAn and declares that archAvathAram is the most approachable manifestation for us in this samsAram based on nammAzhwAr's words . Simple translation: nammAzhwar who gave the thamizh vEdham which contains the essence of all sAsthram, declares that, for the ones who are interested in bhagavath vishayam in this samsAram, it is easier to approach archAvathAra emperumAn than paramapadha nAthan (who is unparallel in his greatness), vyUha mUrthy (who is full of great qualities) and vibhavAvathArams (which are fully pure). It is because archAvathAra emperumAns are full of soulabhyam (easily accessibility), AzhwArs/AchAryas were fully surrendered to archAvathAram emperumAns. Let us see how different AzhwArs have immersed themselves in archAvathAra anubhavam in the next article. Yes swamy - its a good one, and is explained in the svApadhEsa vyAkyAnam- adiyen have already mentioned that in nammAzhwAr's section.